SwitchPoint attendees are in for two full days of talks and workshops with artists, humanitarians, and technologists. Photo courtesy of IntraHealth International. When bad news gets us down, we look for the beacons of progress and ingenuity that may not make the front page—because we know none of us can solve our big global challenges alone. And these powerful women in development are just the beacons we were looking for. They’re making strides in advocacy, aid delivery, and reproductive health. And they’ll all be speaking at IntraHealth International’s 2019 SwitchPoint conference. If you know IntraHealth, you know that we’re committed to creating a world where health workers are safe, capable, and provided with the resources they need to do their best work. So it should come as no surprise that we’ll be passing the mic to Crystal Lander, director of advocacy at Living Goods, this April. Lander is a champion of community health workers and a powerful advocate for greater investment in the global frontline health workforce. Her work pushing for policy changes that strengthen community health programs comes from a keen understanding of the impact community health workers make on a day-to-day basis. “In areas where doctors and nurses are scarce and resources are limited, community health can be a critical linchpin connecting families in hard-to-reach areas with the formal health system,” she writes. Rola Hallam is a pioneer, a British-Syrian activist, and social entrepreneur whose organization CanDo links humanitarians from around the globe with local organizations in conflict areas and war zones. *Unfortunately, Rola Hallam won’t be able attend SwitchPoint 2019 after all, but be sure to follow her work at candoaction.org. And you can check out all of the amazing presenters who’ll be at SwitchPoint next month here. Hawa Talla leads IntraHealth’s work on the Challenge Initiative, a three-year urban reproductive health program in francophone West Africa. She and our Senegal team have made major progress in expanding the use of Sayana Press, a contraceptive injection that’s easy to use. Soon, it’ll even be available for clients to use at home. Talla notes the Senegalese concept of mbolo moy doole—union is strength—as a key reason for that success. It’s an adage we can get behind. Knowing women like these are working toward the same goals we are—including health care for everyone everywhere—makes it a little easier to imagine making universal health coverage a reality. 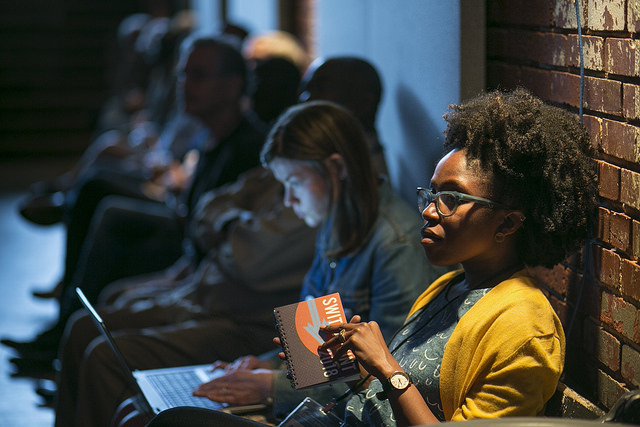 In a few short weeks, we’ll have a front-row seat to these speakers and others as they share their breakthroughs, challenges, and ideas at SwitchPoint, April 25 & 26. Join us. IntraHealth’s annual SwitchPoint conference is where humanitarian innovation, global health, and technology collide. Register for tickets here and be sure to follow us on Twitter @switchpointideas and @intrahealth for updates.